This course is designed to provide coaches with the skills needed to coach teenage and adult players in a club or school environment. 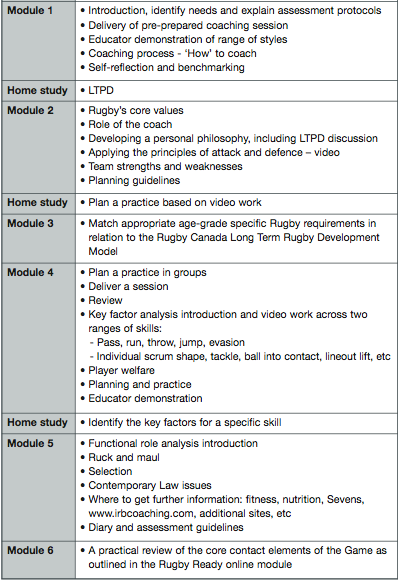 It is extremely important that coaches have an understanding of rugby before taking this course, which is delivered over 18 hours. The course will be delivered through a range of methods and will be highly interactive. Throughout the course, you will be encouraged to practice your coaching skills. Grasp this opportunity for feedback from your World Rugby Educator and your peers. These opportunities will also form the foundation of your competency-based assessment. Select the NCCP Competition Introduction Course option to suit. Register for the NCCP Competition Introduction clinic you wish to take. All coaches will need to take the NCCP Make Ethical Decisions module prior to attending the course they have registered for. Attend and Complete the NCCP Competition Introduction course that you registered for! Satisfactorily complete a diary for a team that is being coached in the current or next Rugby season. The diary should cover a minimum cycle of four practices and two games within that cycle. The diary should provide evidence of a coach’s ability to apply the ‘Plan, Do, Review’ model. The coach’s progress during the course will be tracked on the NCCP Competition Introduction transcript. This serves as the ongoing assessment tool. A full practice plan including the date, time and venue should be submitted to the local Rugby Union no later than 21 days prior to the requested date of the evaluation itself.